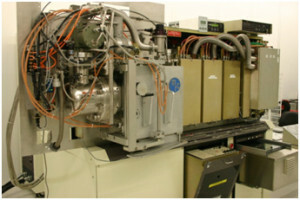 The MRC643 is an ordinary sputter deposition tool, with DC magnetron configuration, or RF magnetron with limited power. The Ti target position has reactive gas possibilities for sputtering of TiN. Possibility of heating substrates with IR lamps, but limited thermal control. The palette is moving so there is no possibility of temperature measurement and limited cooling.